Newsflash…..There is a rather notable and exciting event happening this weekend – apart from World Whisky Day…….the Royal Wedding of Prince Harry and Ms Megan Markle, of course! The glittering and momentous event, which has unsurprisingly attracted worldwide attention, will take place this Saturday 19th May at St.George’s Chapel in the grounds of Windsor Castle, where the Prince was christened. The service will begin at 12pm, when those who haven’t been lucky enough to be personally invited to attend the ceremony can watch proceedings on a choice of TV channels. Whilst the Duke of Cambridge is (understandably) fulfilling his duties as best-man at his younger brother’s side, and missing the FA Cup final to be there, many of us have got other things that we are committed to do on Saturday afternoon – I am one of those – as I will be cheering on my son in a local football tournament (not quite the FA Cup, but the enthusiasm is there!) and watching the glamorous highlights later on. Others on the Go Walkabout Team are embracing the occasion and going all-out for the Royal Wedding by hosting their own bash, decked out in full-on red, white and blue of course, and with wedding nibbles and bubbly on hand to raise a toast to the couple’s health! 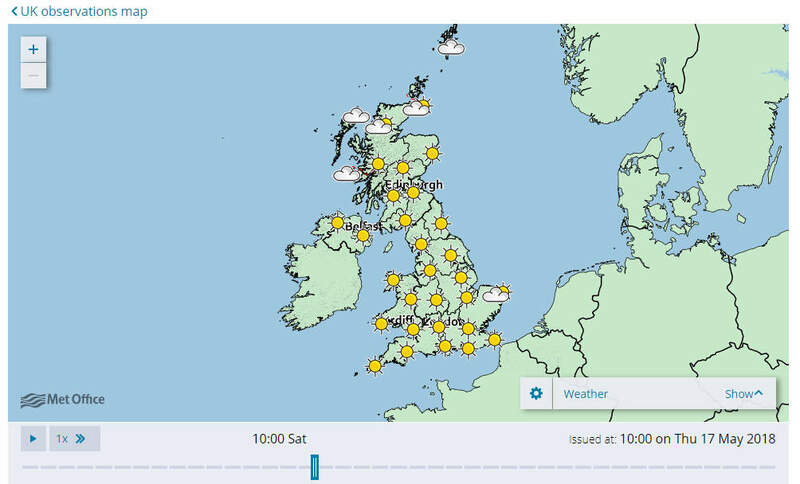 Whatever you are planning to do, the UK weather map for Saturday is encouraging for the majority of us – with most of Britain forecast dry and sunny weather. 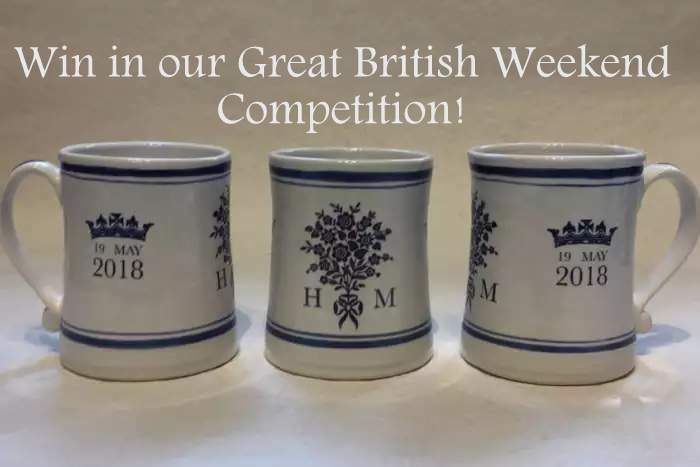 To celebrate this upcoming weekend – however you are spending it – we have got a competition where you can win a gorgeous commemorative tankard pictured at the top of this page, created by the prestigious Rye Pottery, based in the picturesque and historic town of Rye, in East Sussex – just along the coast from us, in fact! Rye Pottery have had the honour of being the official suppliers to many Royal occasions, including the wedding of Charles and Diana. The decorative, yet functional tankard is part of a limited-edition run in soft cobalt-blue on white, and is a fitting tribute to the couple themselves and this historic Great British occasion. Visit the website of Rye Pottery, to see more about them and their great-quality Made and Designed in Britain products. To be in with a chance of winning, you can choose to enter on either Facebook, Twitter or Instagram. We would like to see a picture of what you have gotten up to this weekend – whether it’s involved a celebration of the Royal Wedding or something completely different – from donning Megan and Harry masks and dressing your pet up in a patriotic fashion, to a relaxing and recuperative walk in the great British countryside to enjoy the sunshine – we would love to see what you have been up to, and share the pictures as a celebration of the Great British Weekend! 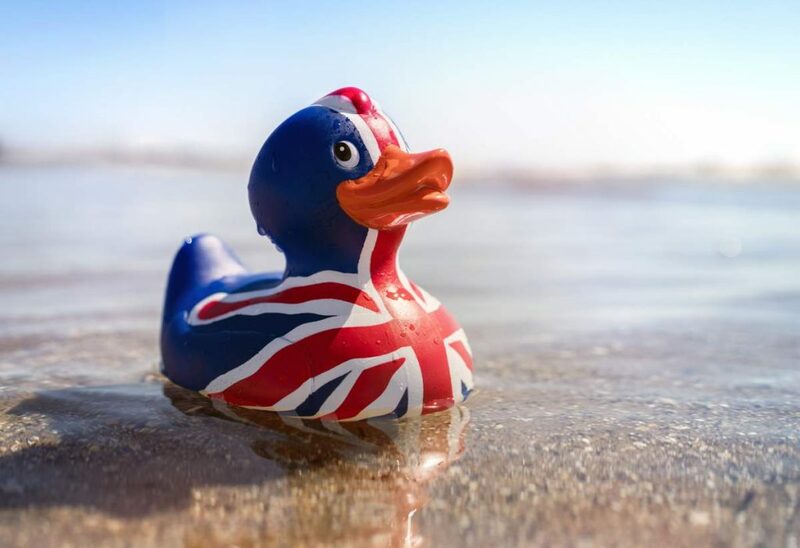 If you’re currently away from the UK, and have your own exciting weekend plans, then we would love to see what you are up to too, but one of the conditions is that the prize must be shipped to a UK address. You must be aged 18 or over, and be either a resident of the UK, or have a UK postal address that the prize can be shipped to. You must not be an employee or related to an employee of Go Walkabout Travel Insurance. You can enter one photo on each of our social channels (3 in total) – Facebook, Twitter and Instagram. You must include #gr8britishweekend as part of your post, if posting on Instagram or Twitter. If adding a photo under the competition post on Facebook, you must also ‘like’ our Page. All entries submitted must be the property of the individual submitting. It is the responsibility of each entrant to ensure that any images they submit have been taken with the permission of the subject and do not infringe the copyright of any third-party or laws. Entrants must warrant that they photograph/video they are submitting is their own work and that they own the copyright for it. The content of the photos must not be offensive and must be suitable for a family audience. Copyright in all images submitted for this competition remains with the respective entrants. However, by entering our competition, you thereby grant permission for Go Walkabout Travel Insurance to feature your submitted image in any of our publications/websites/social media and/or in any promotional material connected to this competition. The closing date and time for the competition is midnight on 21st May 2018. The winner’s name will be picked at random on Tuesday 22nd May 2018, and will be contacted, and the results published on our website. Enter on our Facebook Page! Enter on Instagram! Enter on Twitter! Huge congratulations to our winner Ailsa Sheldon, who was picked at random to win the commemorative mug (you can see the video on our Facebook page) , thanks to everyone who entered. 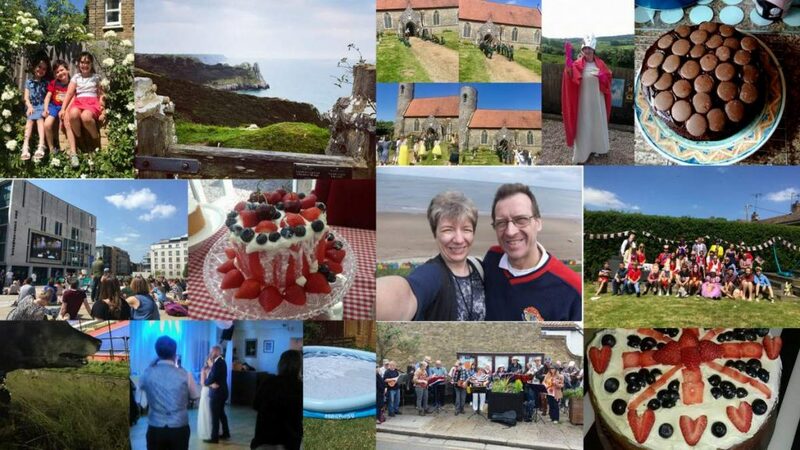 Here is a collage of entries, showcasing some of the fun that was had over the Great British Weekend!